Summer is coming on hard here in the Southwest and with the heat comes a focus on water adventures. 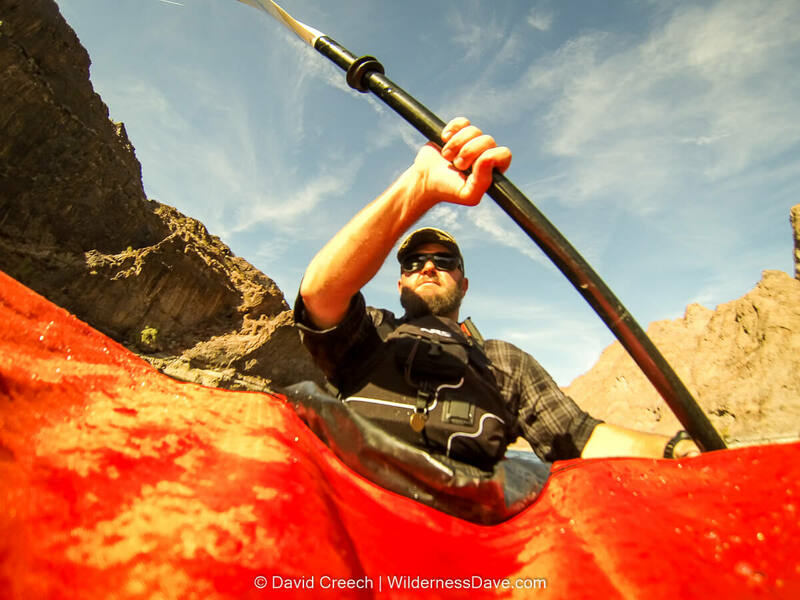 When the sun is beating down and the trails become unbearably hot, it’s time to break out the kayaks. A while back I started thinking about inflatable kayaks. 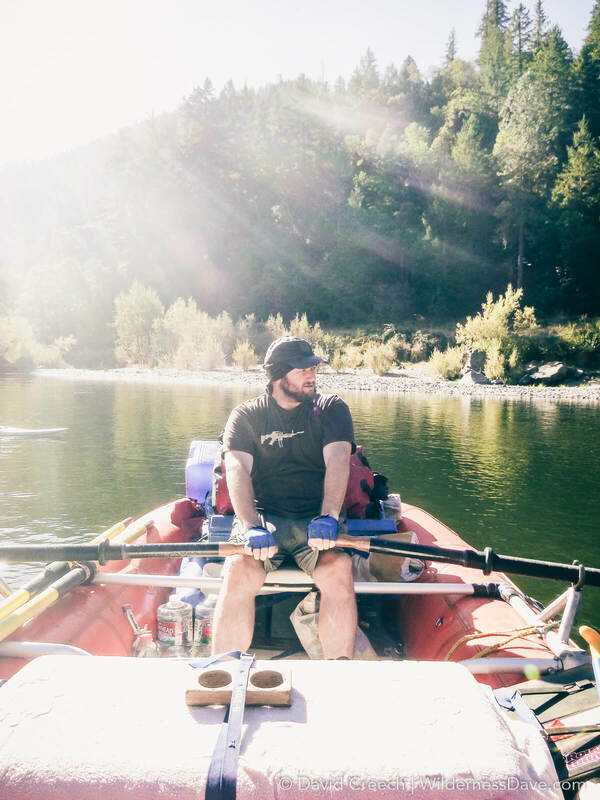 I grew up on the river and spent many a summer paddling or rowing all sorts of water across the Pacific Northwest. I loved the water and missed it terribly when I moved out to Arizona. My wife and I have made an effort to include river and lake activities into our travel, but that involves either hauling a big, heavy kayak around or renting something wherever we end up. Those aren’t always great options, so I started looking for something more convenient. Space is always at a premium when we travel, so looking for a solution that would be compact, easy to use, reliable and lightweight-ish would be key. I remember having an inflatable kayak as a kid. It was one of the cheaper plastic models from the early 80’s and didn’t hold up well to abuse. My brother and I destroyed it after only a couple summers of river trips. Cheap inflatables are everywhere, you can usually grab something inexpensive at Walmart but I’d be lucky to get a single season out of it. That’s just not going to work for me. What I was looking for was something that could travel well, but put up with some abuse. My days rafting big rivers in big boats made me very aware of how easy it is for inflatable rafts to break down or tear apart in rough terrain. So aside from packability and lightweight, I wanted to make sure I found a durable boat that could handle regular abuse. I wanted something that could handle whitewater as well as it could handle flatwater. Finding the right solution would mean maximizing our summer outdoor fun no matter where we go. During my search, I was introduced to Innova Kayaks. Innova Kayaks are one of the first inflatables I’ve seen that have all the high-end production options as the big, expensive professional inflatables but without the price tag. 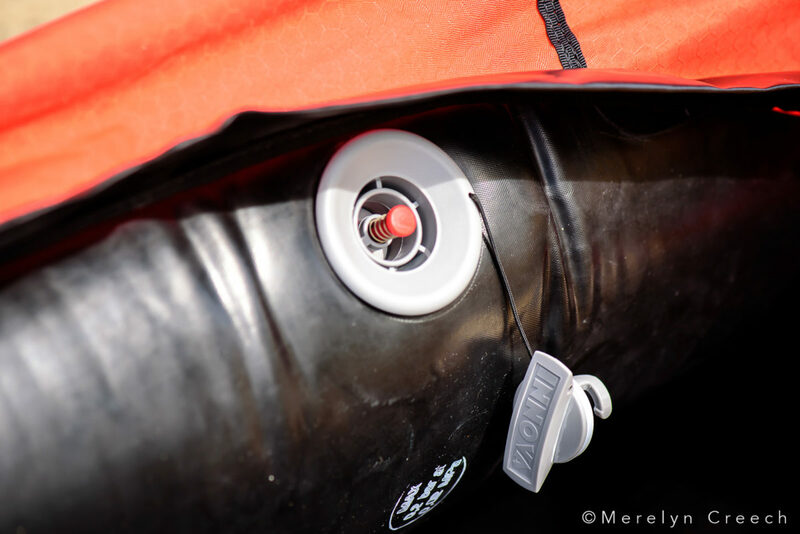 All their kayak hulls are made of Nitrylon Lite™ (NL), a rip-stop polyester fabric, rubber-coated on the interior for air-retention, and Teflon®-treated on the outside for water repellency and stain resistance. This offers durability similar to what you get from the big commercial boats. I was also really impressed to see a commercial-grade valve system on these boats. This is pretty key, considering valve failure is one of the most common problems with inflatables. I have the Innova Swing I single-person kayak which retails right around $600. That’s a pretty good price for any kayak, let alone an inflatable with this level of quality construction (compare that to the NRS inflatables that range from $1000-$2000). Most of the Innova Kayaks also have a heavy-duty rip-stop urethane-coated deck material with zippered access to close in the boat deck. This allows for some good protection that a lot of other inflatables don’t have as well the ability to add a spray skirt ($50) for whitewater kayaking. Another feature of the Swing I is the removable tracking fin for greater stability and control in flat water. The Innova Swing I is a nice-sized, single-person inflatable kayak. 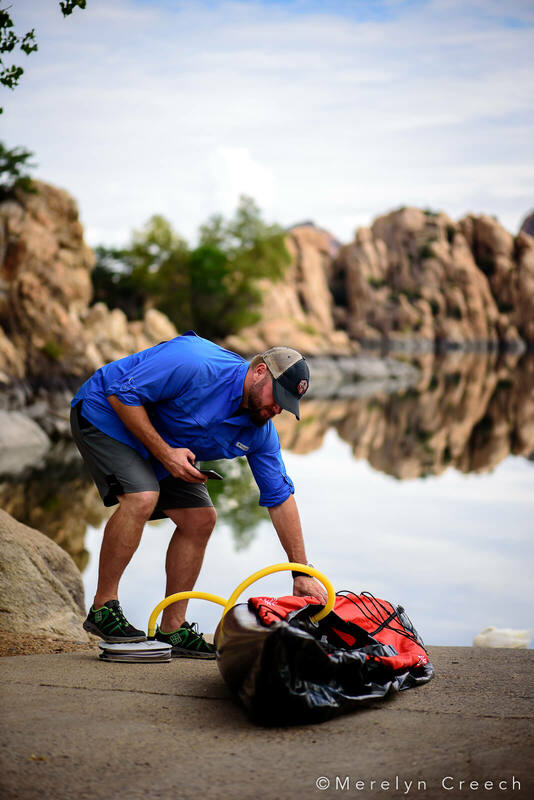 It’s versatile enough to take on just about any kind of water and small enough to be packed into any location. The Swing I rolls up into about 18″x10″ and weighs around 25lbs. Innova makes a drybag backpack to make carrying your inflatable easier. Having an Inflatable Kayak opened up some really cool opportunities for me. 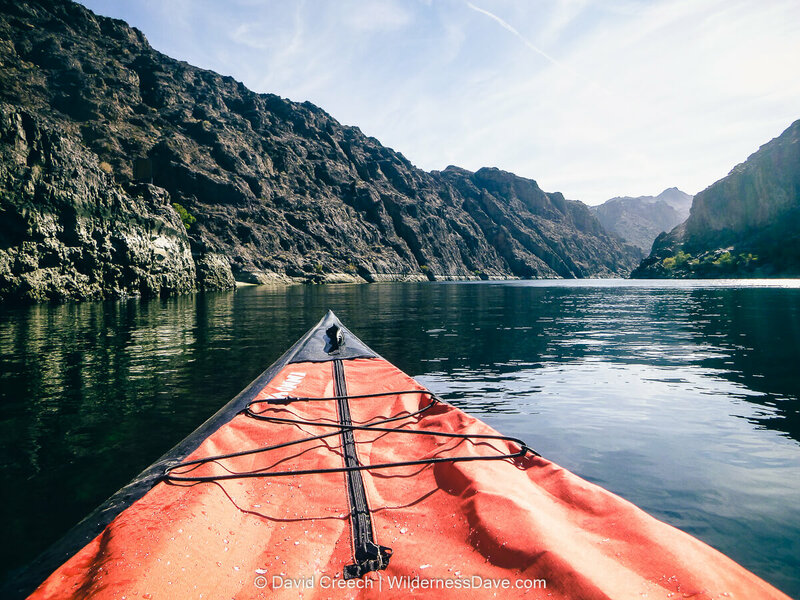 A friend reached out to me last Fall about a possible trip, but it would require packing our raft gear several miles down a side canyon to the Colorado River below Lake Mead. This would not have been possible without an inflatable kayak. We met at the take-out and drove to the trailhead that would lead to our put-in. After a moderate hike down to the river, we were able to toss out our gear, pump up both of the boats, and head down the river in less than an hour. 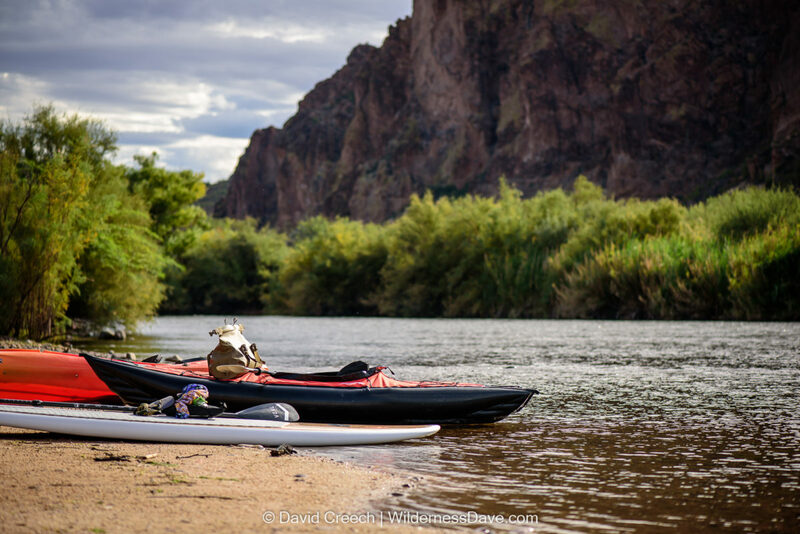 We spent two days paddling the easy flatwater of the Colorado River, camping on a spit of sand attached to the deep rocky canyons. The Swing I performed beautifully on the river and even made for a decent bed at camp that night. Since getting the inflatable kayak, I have found fewer reasons to pull out the old, heavy, plastic kayak I used to paddle around. Now, trips down the Lower Salt River, Verde River, or paddling around the local lake reservoirs is easier and more comfortable. The Swing I is lighter, more manageable in the water, and packs smaller than any other kayak I’ve had. If like me, your summer trips revolve around water you need to look into Innova Kayaks. For the price, they are one of the best options on the market for inflatable kayaks. I’ve been really impressed with the overall quality and durability of the Swing I. Check out the full boat selection from Innova Kayaks on their website. Disclosure: I was provided the Swing I in order to test and review the kayak for performance and reliability. I have done my due diligence testing this product extensively in various environments, conditions, and purposes. The above information is my own opinion of Innova products and inflatable kayaks in general based on my own experiences.